I am so drawn to the couples who want to explore, adventure out into the woods, the beaches, canyons, you name it. The ones who don't mind getting their feet or dresses dirty. Because it's beautiful, it's unique...and so is your love. It's a unique story that is all your own, and being able to capture that seriously gives my heart so much damn joy. These beauties wandered the forest with me, climbed up trees, walked through fern covered hills. They danced around in muddy paths and laughed as rain drops fell from all of the gorgeous trees surrounding us. 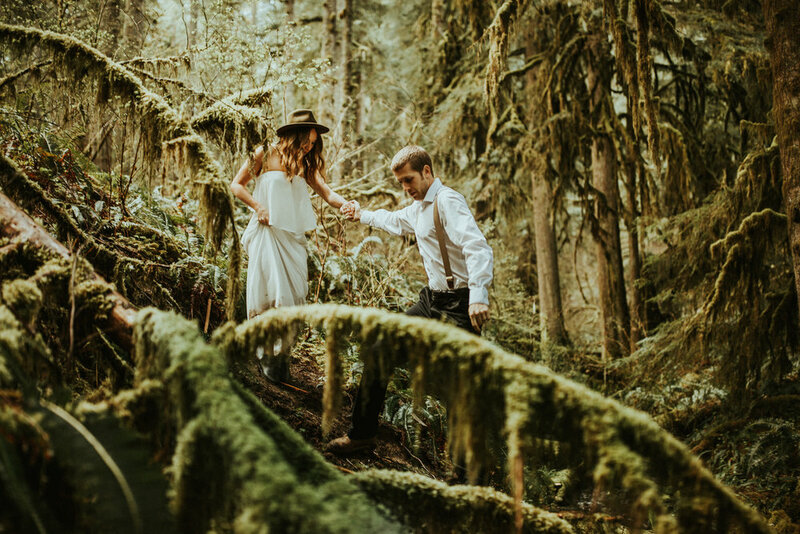 We celebrated their love in one of the most beautiful forests in Oregon. Safe to say I fell in love with these two, with their love story. Katie, my word she is a gem...and I truly feel this way about so many people I meet, but it comes from my heart. And these two, they really are. When you meet people who want you to be a part of their love story, even if for a few short hours, it means more than you know...means more to ME than you know. I got to be a part of this adventure that they will have to look at forever, how amazing is that. It may not seem like much to some, but capture those memories, no matter how small, because they will be gone tomorrow. Katie + Kody gave me an adventure that I also will get to cherish forever, and for that...my heart is theirs!